Coca-Cola has signed its first-ever sponsorship deal with the Premier League in a three-and-a-half-year deal that will see the soft drinks giant use a commercial partnership to promote its entire drinks portfolio. Kicking off in January 2019, Coke will use activations rather than big ads to promote its array of soft drinks, from its full sugar drinks to its flavoured waters and low and no-sugar variants. 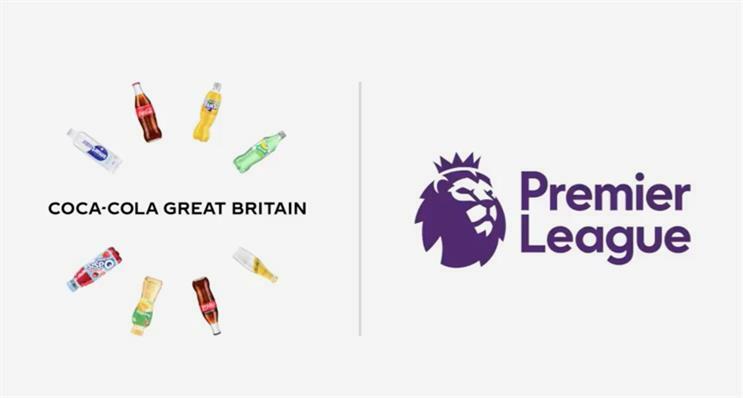 Jon Woods, Coca-Cola GB's general manager, told Campaign that the Premier League deal, as the football competition's soft drinks sponsor, is a great way to bring the multi-brand approach forward. Coca-Cola has released a 20-second teaser video announcing the deal and featuring 20 brands owned by the soft drink giant, including the flagship Coca-Cola brand. Brands including Oasis, Sprite, Lilt, Fanta, Schweppes, Smartwater, Dr Pepper and Fuze Tea make an appearance. "We've a drink for everyone," reads on-screen copy. "Made here in Great Britain." The video also includes a reference to Coca-Cola's #CokeDunks recycling campaign, a TV ad for which launches this weekend. Woods also said that the Premier League trophy tour would give it a great opportunity to promote Coke and engage with consumers at a community level. Activations will span physical and digital, and Woods suggested that "you can imagine [the cup] appearing at stores for the day with our customers". He added: "If you think about the change in marketing, it's becoming more and more experiential rather than static. I think the trophy tour is a great way to bring the Premier League with Coca-Cola to football fans who are also our drinkers." For the Premier League, the agreement with Coke fills its seventh and final category sponsorship, although managing director Richard Masters told Campaign that its other deals are up for renewal or review. Announcements are due between now and the end of 2018 regarding most of the Premier League's current sponsorship deals, such as those with Carling and former title sponsor Barclays. Woods said: "We have a long and rich history supporting football at all levels, from the grassroots to the world stage. The Premier League is one of the most diverse leagues in the world and unites people with a shared passion for football and we’re looking forward to working together to help bring fans to closer to the action."